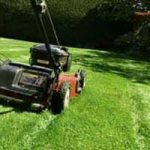 When choosing a lawn mower for your yard, should to know the property your mower needs to handle will help you narrow down the options. A small patch of grass (under 50 square meters) can be easily mowed using a manual reel mower. You’ve got to move a bit faster to activate the blades properly, but there is no engine (so it’s low maintenance and eco-friendly) and the mower can be stored vertically against the wall. How large is your yard? If it’s less than a half acre, a walk-behind mower should do the trick. If it’s larger than a half acre, think about a riding mower—but don’t forget maneuverability. If you’ll need to circle around a tree or two, then your assessment should include a riding mower’s turning radius. How about inclines? On hilly terrain, a riding mower or self-propelled walking mower will make your life easier. Also, bear in mind the quality of your grass—is it thin or thick? To ensure optimal performance on dense or coarse grass, opt for a machine with higher horsepower and taller wheels. Before purchasing a riding mower, take its comfort level into account. Look for models that feature adjustable seats; arm rests and lumbar supports are an added plus. One of the most important details to weigh is safety. Any mower you’re considering should automatically shut down if the operator releases the push bar or leaves the seat. In the case of riding mowers specifically, look for foot controls, as these encourage the operator to use both hands on the wheel. And remember the importance of a parking brake! Keep in mind that your new mower might, and probably will, require maintenance over the course of its lifetime. Save yourself time, money, and headaches by choosing a reliable manufacturer that offers speedy repair service. As important as it is to choose the right mower, it’s only the first part of proper lawn care. For those yards that are in extreme need of clean up, call Lawn Care Flower Mound for a free estimate.